"Mommy! This is the best Burger EVER!!! ", declared Sid, at least 20 times in the 10 minutes, he took to wolf down the entire thing. Sam nodded his head in affirmation saying, "It's really really good", while slathering some more Sriracha on the burger patty. And I think I will agree with them. 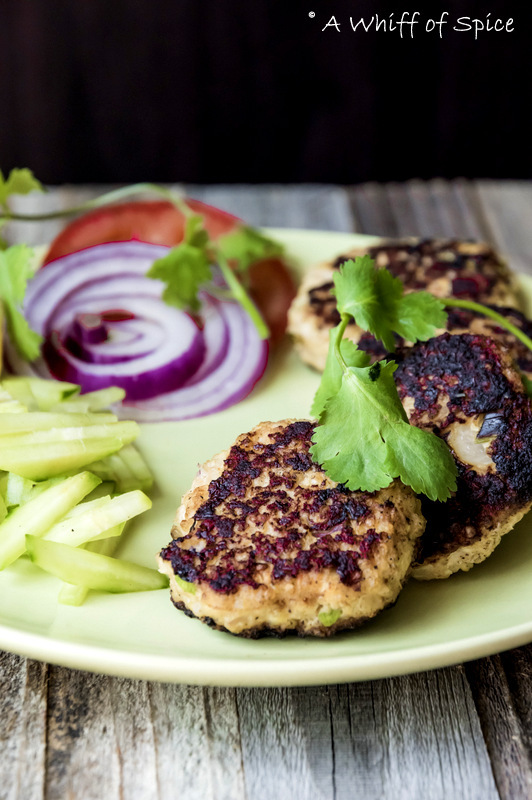 This Chicken and Quinoa 'Pad Thai' Patties is one of my best creation with Quinoa. All the amazing flavors of the delicious Pad Thai in a succulent burger (or smaller patties) with the goodness and health benefits of Quinoa. I think we've got a winner here! Its a no brainer that the most important ingredient in this recipe is the 'Pad Thai' sauce. What makes Thai cuisine so irresistibly delicious is the perfect harmony of Four Flavor Pillars - Sweet, Sour, Heat (Spicy) and Salt. This 'Pad Thai' sauce is also based on the same principle. To incorporate the Peanut flavor, which is another critical component of a traditional 'Pad Thai', I use Peanut Butter. It gave the yummy peanut flavor and also helped as a binding agent. 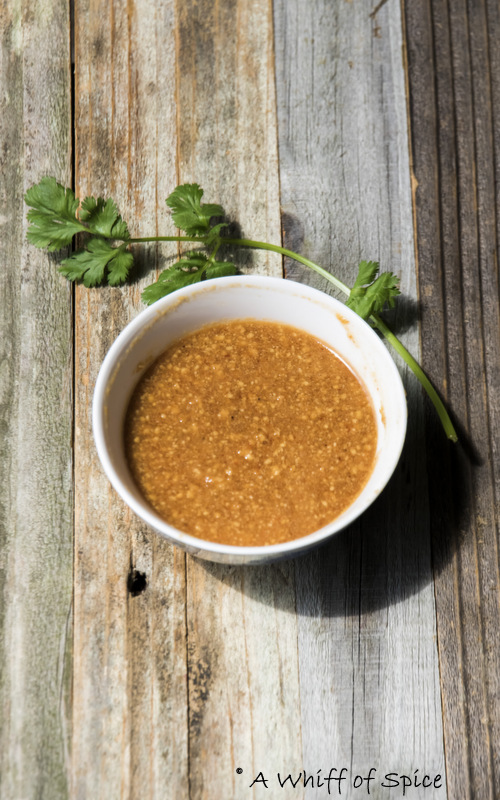 The Sauce is a simple mix of Peanut Butter, Honey (Sweet), Lime Juice (Sour), Sriracha (Heat) and Fish Sauce (Salt). I also added a healthy doze of grated ginger and garlic for added flavor. The rest of the recipe is quite straight forward and pretty much like my Chicken and Quinoa Patties with Carrots and Zucchini. Just mix everything in a big bowl; form patties; sear it on a hot skillet and then finish it off in the oven. I read here, that when you sear and then bake your patties in a hot oven at 400 degrees, they turn out way juicer than just grilling or pan frying them. And it really works. Because of lack of gluten, the patties are a little delicate. Finishing off in the oven is the best way to ensure that they do not break while flipping, especially the larger 'Burger Style' ones. Though I tuned the larger patties into burgers for Sam and Sid, it's more fun to make small appetizer sized patties. Serve with a dipping sauce and fresh salad, or you can create your own lunch or dinner bowl with it. 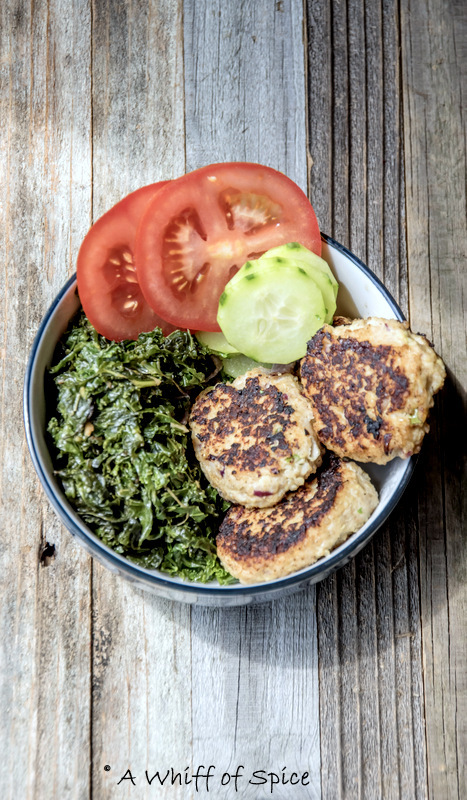 Since the patties are loaded with Quinoa, they are nutrient dense and very filling and a mini meal in themselves. 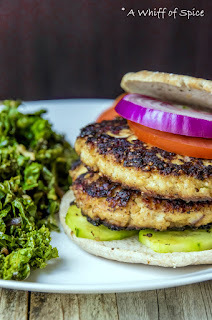 While Sam and Sid, enjoyed their Chicken and Quinoa 'Pad Thai' Burgers with stir-fried Kale on the side, I made a delicious Bowl with baby patties, loads of stir-fried Kale and a fresh serving of cucumbers and tomatoes. A complete meal in bowl! 2. In a small bowl, mix together all the ingredients under Pad Thai Sauce. Mix it well with a fork. Taste and adjust the sweet, sour, heat and the salty aspect of the sauce to your liking. I added a wee more Sriracha and lime juice. Keep aside. 3. To cook the quinoa, bring a saucepan of salted water to a boil. Add the quinoa and cook till soft. 4 to 5 minutes. Drain and keep aside. 4. In a large bowl, mix ground chicken, quinoa, onions, beaten egg and lime zest. Add the prepared 'Pad Thai' Sauce and mix well. Form small 'appetizer' patties or larger 'burger style' patties. 5. Heat a wide skillet over high heat. Add a tablespoon of oil and sear the patties for about 1 minute on each side, till it has a nice crust. Transfer the patties to a greased Baking Sheet and finish off the cooking, in a preheated oven at 400 F for 5 to 6 minutes or till cooked through. Alternatively, you can shallow fry or even deep fry these patties. 6. Serve with a dipping sauce of choice. Or with roasted or stir fried veggies and greens as a part of lunch/dinner bowl. Or in between a bun as a burger. 1. Higher in protein — its protein balance is alike to milk and has more protein contrasted to rice, millet or wheat. 2. A good resource of riboflavin — riboflavin helps decrease the frequency attacks in migraine sufferers by boosting the energy metabolism within the muscle cells and brain. 3. The saponins from quinoa are utilized to help healing of skin injuries in South America, which makes it a good sterile. 4. Its alkaline-forming. Although it is not powerfully alkaline-forming, it is similar to wild rice, amaranth, and shoot out grains. 5. It simply has 172 calories per ¼ cup dry quinoa. 6. Since it is not associated to wheat or grain, it’s gluten-free. Millions of people are discovering they feel recovered and lose weight when they decrease gluten grains or at least wheat products. 7. It is a multifaceted carbohydrate with little glycemic index. This is again good for weight administration. Quinoa is rich in a number of minerals, vitamins, fats and proteins. It can be a complete meal and enhance the dietary portion of your diet. Add quinoa to your diet and feel better.